It's Memory Lane Friday and today's topic is a memory from first grade. Everyone is welcome to link up their memories. Back in first grade was when they started reading groups. There were four reading groups, and each of the groups was in a different corner of the classroom. Wonder if they still break classes up into different reading groups, based on ability level? Seems there would be a nicer way to handle it. At any rate, I was in the advanced reading group because I'd been reading for a while already. So one day we were in reading group and I was wiggling away at a loose tooth. Wiggle wiggle wiggle. All of the sudden, to my horror, it fell out! I sat there with the detached tooth in my mouth and didn't know what to do. Should I say something? I was such a timid child, that I couldn't imagine speaking up. Gradually, I slipped the loose tooth into my pocket, and never said a word. I was upset all day over that tooth. When I got home, though, and found out about the existence of the tooth fairy, I felt much better. And when I got makeup for playing dress up under my pillow the next morning, I was feeling great about the whole thing, and couldn't wait to lose my next tooth! If you'd like to link up to Memory Lane Friday, add your website to the link below. Please take the time to go visit and comment on other's blogs as well! Next week is a 'no theme' week on Memory Lane Friday. You had a fun tooth fairy! Awww, I'm glad the Tooth Fairy helped you realize losing a tooth was okay. This is such a sweet story! Bless your heart, you were too shy to even speak up and say your tooth had come out!! I remember I fell badly while roller skating once and I went home, but styed on the front porch crying and trying to stop my bleeding. Someone finally came out and found me. I still have a scar on my knee to this day. Your tooth fairy gave better stuff than mine. I always got 50 cents...makeup would have been way cooler! Good memory you have....I can't recall the exact moment I lost my first tooth at all! My oldest has his first wiggly tooth! Oh, and reading groups are evil. I was in the top reading group in my first grade class- and then we moved schools. They were using the same reading books as us, so my teacher just plunked me in whatever group was on the same story where I left off in my old school- which was NOT the top group. I was so upset. What a fun tooth fairy story! Thank you for stopping by and supporting Ian. I enjoyed hearing that you had gone through a drought too. It makes the world seem like a smaller, closer place. 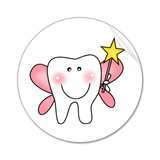 Ah, you had a great tooth fairy! I don't think I ever lost a tooth at school. They do still put the kids in different groups according to their reading level. My son is in kindergarten and talks about being in different groups. What a cute story! That so sad you were too affraid to say something.